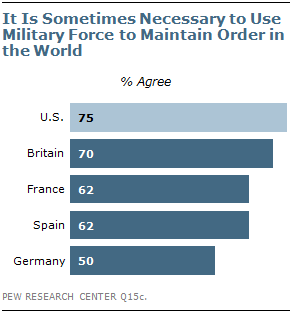 While Americans are somewhat more inclined than Western Europeans to say that it is sometimes necessary to use military force to maintain order in the world, 62% of people in France shared that view in a survey conducted March 21 – Apr. 5 2011, before the current French intervention in Mali. Publics in the U.S. and Britain are the strongest supporters of the idea that use of military force is sometimes necessary, with 75% of Americans and 70% of those in Britain holding that view. In Spain, 62% say use of force is sometimes necessary while Germans are evenly divided with half saying the use of force is sometimes necessary and half saying it is not. In Britain, France, Spain and the U.S., conservatives, are more likely than liberals, to agree that the use of force is sometimes necessary to maintain world order. However, in the four countries, majorities across ideological groups express this view. When asked whether their country should get UN approval before using military force to deal with international threats, American opinion differs considerably from that of Western Europeans.